Undergraduate student Cesar Miranda blogs about his experiences studying abroad in Shanghai. I will be brief this time since I’m in the middle of finals week, but I still wanted to share a few photos and thoughts with you guys! Shanghai has been an incredibly awesome experience, and I am actually pretty bummed that it’s about to end. It is time to go back to the real world now. Although my previous post focused on my trips outside of Shanghai, on this post, I’d like to focus a bit more on Shanghai, and then on my final trip of the semester to Beijing. I took this photo in Pudong, which is the modern part of Shanghai. Actually, in the early 1990s, this area was completely undeveloped. Today, it has some of the tallest skyscrapers in China. The Shanghai Tower (in Chinese, 上海中心大厦), still under construction in this picture, is set to become the tallest building in China and the second tallest in the world. This picture was taken around Century Avenue, where I believe the new NYU Shanghai campus is being built. This next picture is of my visit to the Communist Propaganda Museum, which is located in the basement of a residential building and has hundreds of posters. Looking at all these posters sorted in chronological order is a great way to learn more about Chinese modern history. Definitely worth a visit! Although living in Shanghai has been one of the most rewarding experiences of my life, there have been some problems. Unfortunately, this picture is not one of a foggy day. It is a picture of Shanghai on its most polluted day in recorded history. Pollution levels in Shanghai have been record-high this semester. While in New York, it can be sunny, rainy, cloudy or snowy, in Shanghai you must add another one: polluted. If a day when the air is in the “unhealthy” range is considered to be a good day, then something must be wrong. A little bit more than a week ago, the pollution index almost reached 600, which is considered to be “beyond index”, and more than 20 times the WHO’s recommended threshold. People started feeling sick, and it was just not a good day. However, the government really is taking strong measures to tackle it. This should by no means discourage anyone from studying abroad in Shanghai. Facemasks can be very helpful if it actually gets bad, but I have only felt like I needed them a couple of times this semester! Within Shanghai, there is a beautiful water town called Zhujiajiao. It is very pretty, and you can simply walk around or get on a boat, and get lost in its narrow and winding streets. It’s not far away from the city center, yet it is just so different. While I know I said I was going to focus on Shanghai in this blog post, I cannot ignore my visit to the country’s capital, Beijing. 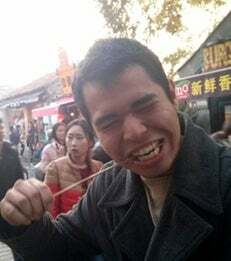 In this picture, I am reluctantly eating a scorpion. It’s very crunchy, yet not very flavorful. We visited the Great Wall at Mutianyu, and it was truly breathtaking. We took a cable car up, and we used a slide to get down! Last, we visited Tiananmen Square and the Forbidden Palace. It was a great ending to a great trip, my last trip of the semester. Now I am ready to go back home, and then go back to the Square with a completely different perspective. Although I have finished the study abroad component of BPE, I have not finished my global education in Stern. I am participating in the International Studies Program (ISP) next semester, and I will be going to Ho Chi Minh City in Vietnam for Spring Break. I also plan to take the Stern India course on economic development. BPE is how I got started with this travel bug, and I don’t intend to stop exploring. Cheers! My name is Cesar Miranda, a junior studying Business and Political Economy (BPE) at Stern. As a BPE student, I’m spending three semesters abroad: two in London, and one in Shanghai. I could not be happier about this requirement, given that it has given me the opportunity to see twenty new countries in a year and a half, enhancing my academic experience and allowing me to be truly global. As I begin my third month in Shanghai, I am experiencing some mixed feelings about my imminent return to America. My adventure began in Hong Kong, where I decided to spend a few days before the beginning of the semester. Hong Kong is a former British colony that is now a Special Administrative Region (SAR) of China. Hong Kong is truly a melting pot between several cultures, and an extremely interesting city overall. Cantonese cuisine in Hong Kong, especially dim sum, is amazing. The most exciting part, however, is just to climb up to Victoria Peak or cross over to Kowloon and stare at the skyscraper jungle that this city has become. During this same trip, we also visited Macau, a former Portuguese colony a little bit more than an hour away from Hong Kong by ferry. Shanghai itself is a truly amazing city. While the skyline looks austere in comparison to Hong Kong’s, it still is gorgeous and full of secrets. During welcome week, we took a cruise along the Huangpu River at night. NYU Shanghai is now an independent portal campus, but the move to our new facilities in Pudong (Shanghai’s new area) is not over yet. We are currently located in East China Normal University, and live in off-campus apartments 15 minutes away from campus. This is a wonderful neighborhood, with a perfect mix of west and east, of old and new. And hey, we get to walk by a waving statue of Chairman Mao every time we walk into class. The most important part of one’s study abroad experience is, obviously, studying. However, if one wants to actually immerse oneself into the culture of the host country, travel and exploration are key. I visited the ancient city of Xi’an, which is home to the world-famous Terracotta Warriors. It is stunning to see how detailed each one of the soldiers is, and how vast the complex is. Xi’an is also famous for its large Muslim population, and for its city wall, where one can rent bikes and ride over it. During fall break, I engineered a weeklong trip that would take me through four Chinese provinces with a mix of trains, buses and planes. Our trip began in Huangshan, also known as the Yellow Mountain. Huangshan has some of the most beautiful landscapes I’ve ever seen, especially as the fog descended on the mountain. We also visited the ancient village of Hongcun. We stopped in Hunan Province en route to Guilin. In this province, we transferred to a “hard seater” train, a very uncomfortable 10 hour ride that would drain our energy. Nevertheless, we still enjoyed the Li River valley, as we walked for five hours exploring the beautiful scenery around it. We even took a bamboo raft on the way back to our hostel in Xinping! Finally, we arrived in Dali, a city in Yunnan province. The city itself is very beautiful and touristy, and has many really cool attractions. The Three Pagodas are located in this town. As a fun fact, one of the main streets with bars in the town is called Foreigners Street! That's it for this time! My next post will cover more about life in Shanghai, and a couple of other cool destinations.